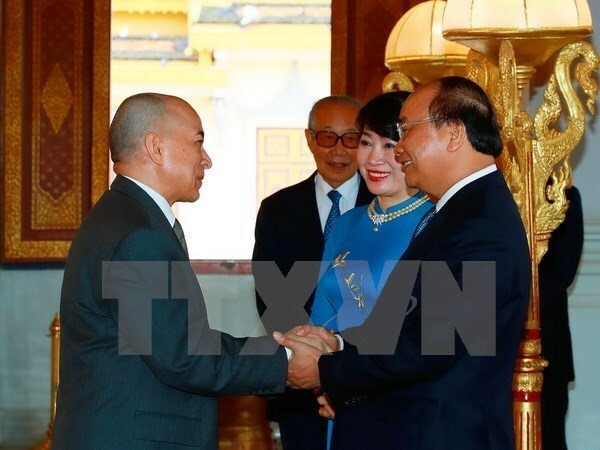 Phnom Penh (VNA) – Prime Minister Nguyen Xuan Phuc visited Cambodian King Norodom Sihamoni right after his arrival in the country on April 24. At the meeting, PM Phuc expressed his pleasure to make his official visit to Cambodia when the two countries are celebrating the 50th anniversary of diplomatic relations. He lauded socio-economic achievements Cambodia has made under the reign of King Norodom Sihamoni, particularly its increasing position in the region and in the world. Highlighting the King’s significant contributions to consolidating the partnership between Vietnam and Cambodia, PM Phuc said he hopes for the King’s further support for the ties. Vietnam always attaches importance to the traditional friendship and comprehensive partnership with Cambodia, he said, adding that Vietnam continuously remembers the King’s valuable assistance to Vietnam during its national construction and defence. King Norodom Sihamoni said he admires achievements Vietnam has obtained during its national development and recalled the late King Norodom Sihanouk’s recommendations on cementing relations with Vietnam. He spoke highly of his guest’s current visit, saying he believes that it will contribute to further enhancing bilateral cooperation. PM Phuc took the occasion to deliver an invitation to visit Vietnam to his host and Queen Mother of Cambodia Norodom Monineath Sihanouk, which was accepted. Acknowledging their contributions to Vietnam-Cambodia relations and difficulties in the host nation, Phuc affirmed the commitment of the Vietnamese Party and Government to assisting overseas Vietnamese.